Awesome read. The Real Deal. He allows us to walk with him on His journey through the grace of God in missions, by challenging us to leave our comfort zones. He asks pointed questions to challenge us not to be comfortable, but to be about God’s good, pleasing, and perfect will. Chase God on your knees is what Carlos challenges us to do, well he challenges me to do. I fall so short in ministry and I am thankful for a brother who cares enough to challenge the status quo and call people out of the pews and motivates them to ministry, no matter where it takes them. May God bless you as you read this one Missionary families journey through the rocky road of life with an amazingly awesome God who provides, even through storms. In the past, I have primarily connected God’s Grace with the story of the cross and the suffering and death of Jesus to provide eternal life for believers. But, in their book, “Living the Great Commission”, the Llambes explain that God’s Grace is not just about what He has already done … God’s Grace is on-going and active TODAY, especially through the power of His Holy Spirit working in us! In church planting, Carlos and Liliana and their children have experienced this in their own lives. So, I want to thank them for this book that expands one’s definition and understanding of God’s Grace to now include Him being there to love and empower us to be brave enough to pass on His Grace to our neighbors – even if it means we must leave our comfort zones. 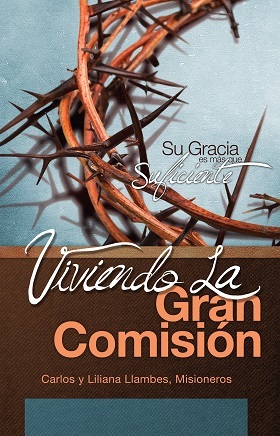 I encourage you to read “Living the Great Commission”. I promise its’ message will strengthen you to obey His call in your own life!